While visiting Washington State in early November, I got to visit the Oh Boy! Oberto factory store, and found this "Steakhouse Seasoning" variety. It's been around for awhile, but I haven't been able to find it in my neck of the woods. This bag has a sticker on it that says, "Ends & Pieces". In fact, many of the bags of jerky sold at the factory store has this sticker on it. One thing worth noting is that the factory store still sells jerky in 4 ounce bags, whereas the grocery stores mostly carry the smaller 3.5 ounce bags. It's not an older jerky, the date stamp was for 8 months into the future. My guess is that the factory is trying to use up all of its 4 ounce bags. Beef, dextrose, brown sugar, corn syrup solids, flavorings, water, salt, yeast extract, sugar, soy sauce, sodium erythorbate, sodium nitrite, lactic acid, extractives of paprika. Contains beef from one of more of the following sources: Australia, Brazil, New Zealand, and the United States. The tastes I pick up from the surface of these pieces is a peppery, sweet, garlic, spicy flavor. In the chewing, I pick up some salty flavor. 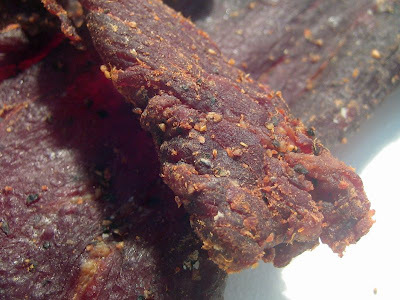 The black pepper has a strong flavor in this jerky, and I'll go on to add that it's the dominant flavor overall. It leaves behind a strong aftertaste. There's a saucy flavor as well, as if it were trying to mimic a taste of steak sauce. It's got a spicy bite to it, perhaps more reminiscent of A1 Steak Sauce, perhaps as an answer to Jack Link's A1 Steak Sauce variety. I'd nominate that flavor as the second-most dominant in this jerky. That spicy bite presents a bit of hotness that I'd rate around mild-medium on a single piece, but builds up to a medium level over the course of several pieces. Lesser tolerable tongues might see this as medium-hot. So does this taste anything like its "Steakhouse Seasoning" namesake? Well, I think it does. It does indeed provide a flavor that reminds me of the bits of seasoning stuck to a steak at a higher-end steakhouse. I also get the hints of steak sauce flavor as well. I get no natural meat flavors in this at all. The salt taste intensity in this is moderate. The amount of sweetness I mentioned is not that heavy, but it seems a little more pronounced than Oberto's original variety. The garlic taste is not strong, but identifiable. These appear to be slices of whole meat, sliced to an average thickness, and in small, medium, and large pieces. It's kind of a mixed bag of pieces, with some being rather dry, and others being rather soft and tender. Some had some moisture to it, and others were on the hard side. Some required a good deal of effort to tear into small pieces, while others I could bite off with my teeth with ease. I'll note again, the sticker on this bag that said, "Ends & Pieces". My initial assumption was that this bag contains smaller, chunkier pieces, similar to bacon ends. But the size and shape of these pieces look exactly like what I'd expect to find in any other bag of Oberto's. Maybe "ends & pieces" is a more marketable way of identifying pieces that got pulled off the conveyor belt and tossed into the reject pile? In terms of chewing texture, it has something of a steak-like quality, but not totally. It tends to crumble apart to a certain degree, with a slight rubbery nature. It's a messy jerky as well, leaving bits of peppery and spices all over my lap and desk. Because some of these pieces required some effort to tear apart, that created a jerking motion after a piece tore off, and that cause pieces of spice to fly everywhere. I didn't necessarily find any significant amounts of fat on these pieces, just some fragments here and there. But I did find a good deal of membranous tissue in this meat that remained behind in my mouth. I also found one piece with a sizeable streak of gristle. I paid $2.49 for this 4 ounce bag at the Oh Boy! Oberto Factory Store in Seattle, WA. That works out to a price of $0.62 per ounce, making this a cheap buy. 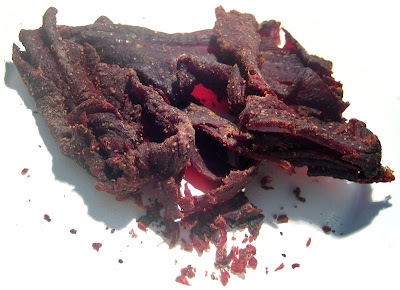 For general purpose jerky snacking, that low of a price makes this an excellent value. I found the strong flavor to be very snackable. The meat consistency is not that great however, and the chewing texture is subpar. But the great flavor, and cheap price makes this tough to beat. For being marketed as "steakhouse seasoning", I think it's also an excellent value. I do feel as if this has the taste of steak seasoning, it even has the smell. I found this Steakhouse Seasoning variety of Oberto's to have a great flavor in the black pepper, sugar, garlic, and spicy steak sauce-like flavor. It also has a good deal of flavor intensity, and a decent level of flavor complexity. I still didn't find any natural meat flavors in this. But then again, I can still assign a "good" or "best" rating without natural meat flavors, if the seasonings and marinade are exceptional. And while I do like the flavor of this, I still found the meat consistency below average. My sense is that the "ends & pieces" sticker on this represents the rejected pieces. And if that's the case, then I can't write a totally fair review. But I have eaten plenty of Oberto jerky before, and knowing their meat consistency, it isn't too far away from what I found in this bag. So, I'm going to keep it at an average rating. For a good beer recommendation, try a creamy smooth stout.